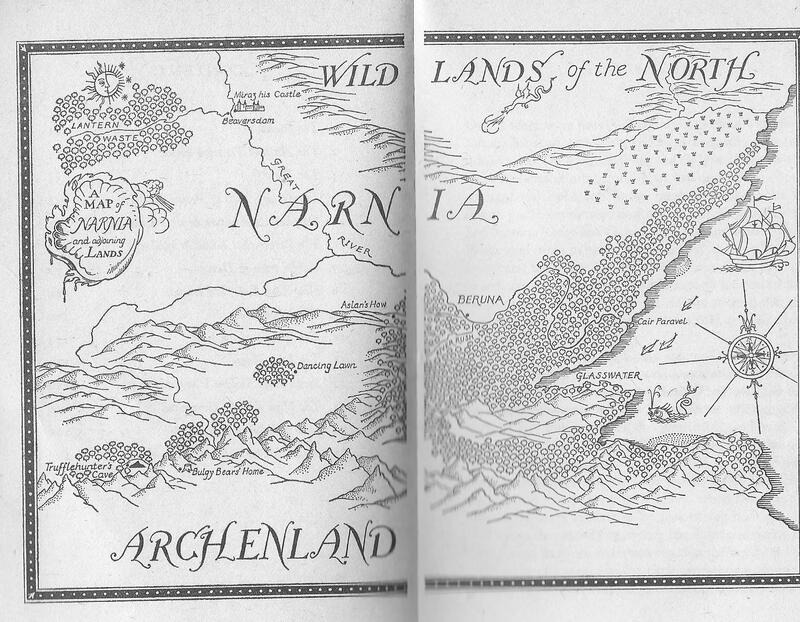 Earthsea, Narnia, Middle Earth – the three classic fantasy worlds I talked about last week – are distinctive places. Most children – most people you meet – have a pretty clear picture of at least the last two, and even if they haven’t read the books, will certainly have heard of them. I venture to suggest, as a thought experiment, that if you were dropped at random into one of these worlds you would soon be able to guess which one it was. There has been a lot of fantasy written since these worlds were created, but not much that competes with them in iconic status and recognisability. Try thinking of names of other worlds, and “Discworld” is the only one that springs readily to my mind. At the border where fantasy and science fiction blur, there may be others – but what in fact are modern writers doing with fantasy worlds? Is sub-creation, as Lewis called it, their primary concern? 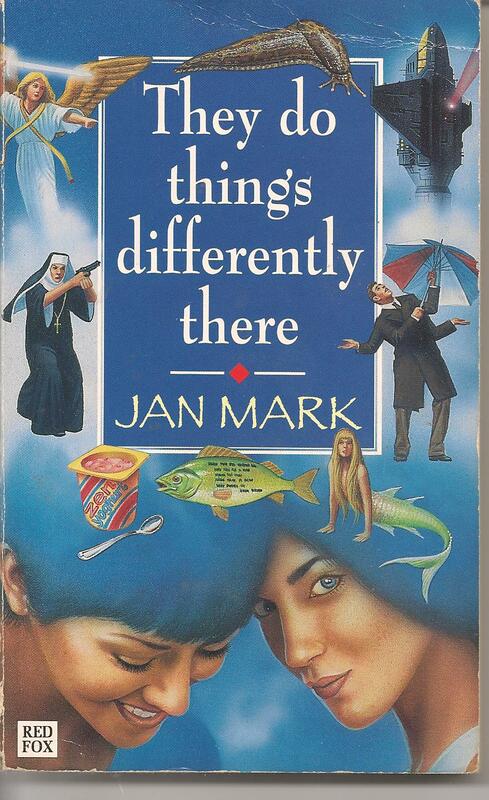 Here follows a roundup of some of the ‘other worlds’ I myself have encountered in children’s and YA fiction. I’d be interested to hear of others. 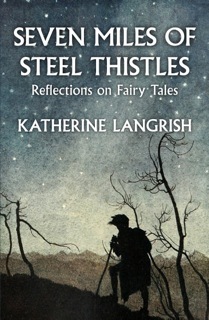 Fascinating, fun, and sometimes thought-provoking though these books are, they are not – and were never intended to be – creations of fantasy worlds in the classic sense. But they share a purpose with the next one I’m coming to: Terry Pratchett’s ‘Discworld’. Discworld has grown enormously over the series. 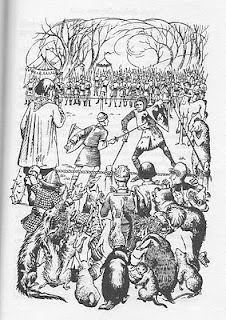 It began – in “The Colour of Magic” as a spoof, a comic take on sword-and-sorcery novels, with characters like the incompetent wizard Rincewind and the warrior Cohen the Barbarian. It was brilliant comedy, spot on the mark. But Pratchett was too good a writer to remain content with such an easy target. The books rapidly deepened and became more serious of purpose (though still extremely entertaining). Discworld fits the criteria for an instantly recognisable, self-contained imaginary world. It is carried through space by four elephants standing on the back of a giant turtle. It has a consistent geography, with its central mountain range at the Hub, the Ramtops, the city of Ankh-Morpork, the cabbage fields of Sto Lat; its directions (hubwards and rimwards rather than north and south ). There is nowhere quite like it... except that nearly everything in it is a deliberate borrowing from our own Earth, viewed through a slightly distorting fantasy lens that paradoxically allows us to see it rather more clearly. I don’t know of a more passionate advocate than Pratchett for racial and sexual equality. We might be reading about dwarves and trolls, but we’re not fooled. When Commander Vimes employs trolls, werewolves, dwarves, zombies and vampires in the City Watch, it’s not because they all live together in Ankh Morpork like one big happy family. Read ‘Feet of Clay’; read ‘Equal Rites’. Discworld, like the worlds of Aiken and Wynne Jones, sets Pratchett free to say exactly what he wants in a way quite different but not less seriously intended than so-called ‘realistic’ fiction. But does fantasy have to have a ‘message’? Can’t it just be for entertainment? I wouldn’t like to pronounce on that, but I do think that it has to have a purpose: you have to know why you are writing fantasy and whether, as C.S.Lewis said about children’s fiction, it’s the ‘best medium’ for what you want to say. The charge of ‘escapism’ so often levelled against fantasy, implies that reading and writing fantasy is a frivolous occupation. Even if that were true, I see no reason why it should be disapproved. Plenty of human occupations are frivolous, yet no one objects: popular music, days on the beach, fashion, eating out, good food and wine. Yet many of us who love fantasy feel there is something more to it than this, that at its best it can provide something essential to the spirit. Escape, as either Lewis or Tolkien pointed out, is judged according to what it is you are escaping from. If reading fantasy impairs us for real life, that would be bad, but it’s by no means proven. Can’t see it did me any harm at all. But here are three interesting books which study the effects of fantasy worlds built by young people, and ask what purposes they serve for good and for harm. The day everything changed, Singer Graia took Rialle’s class down the Five Thousand Steps to the west beach. They followed her eagerly enough. A Mainlander ship had broken up on the reef in the recent storms, and the Final Years were being allowed out of the Echorium to search for pieces of the wreck. 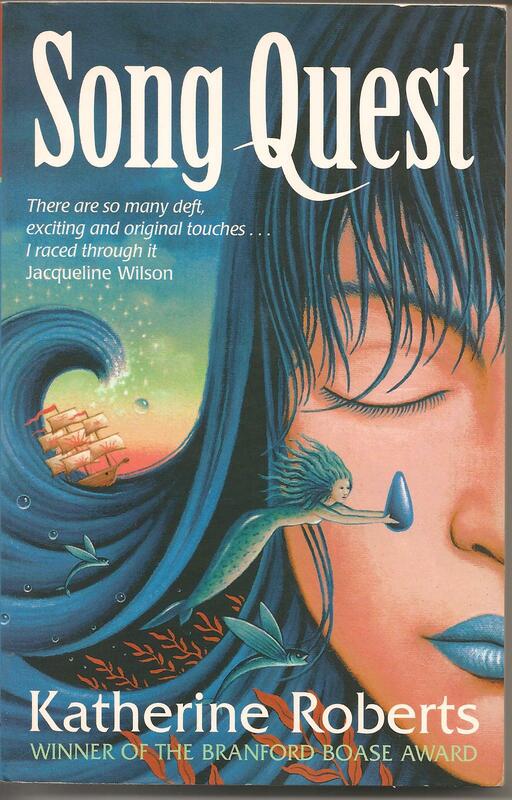 Soon he was surrounded by flapping rainbow tails, coils of silver hair tangled in seaweed, gaping mouths and gills, reaching hands, wet pleading eyes – and those terrible, terrible songs. “Help us,” they seemed to say. The creatures’ struggles grew less violent. One by one their arms and tails flopped to the deck, and their luminous eyes closed. Kherron opened their guts as swiftly as her could and scooped out handfuls of their unborn children. It helped if he didn’t look at their faces. That way he could pretend they were just fish. This is strong stuff, and Roberts is clearly interested in the differences between a superficial adherence to peace and harmony – the soothing songs of the Singers, the diplomatic missions – and the blood and guts reality that it may not be possible even literally to keep your hands clean. Colourful adventures in imaginary places don’t have to be anodyne: even heroes and heroines may do some very bad things. But in YA fiction, the learning process is usually what counts, and hope is never forgotten. 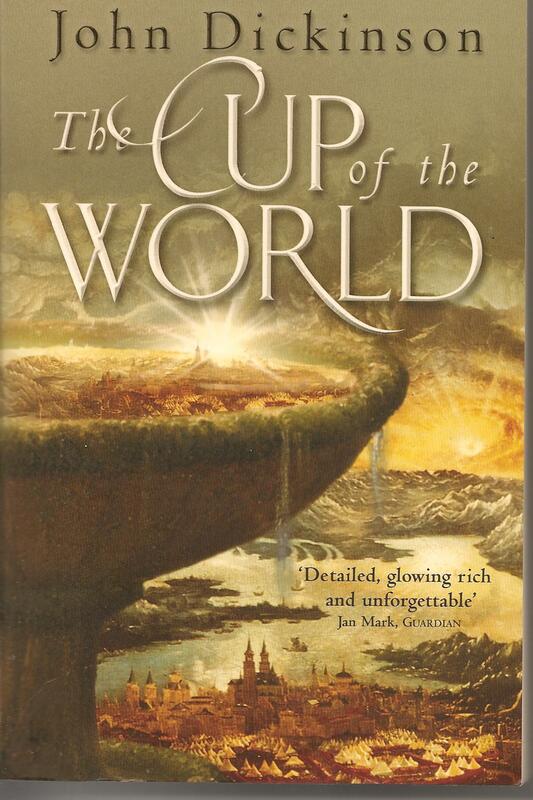 John Dickinson’s fantasy trilogy – beginning with ‘The Cup of the World’ (2004) – is a more downbeat series. It’s set in a claustrophobic medieval-style kingdom, in a world pictured as held in a vast cup and circled by a snake or cosmic serpent. All of the characters are flawed: civil war is rife, and the main characters are themselves descendants of invaders from over the sea. Long ago, their ancestor Wulfram led his sons against the indigenous hill-people, whose goddess Beyah still weeps for the death of her son. 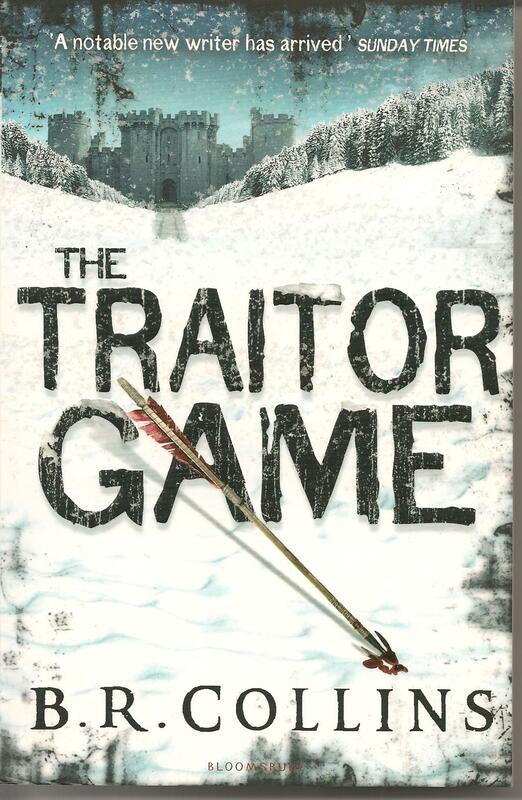 It’s an intricate story which no brief summary can do justice: but the narrative is dark and fatalistic, with a gloom bordering at times on pessimism. This trilogy is a great corrective to the notion that fantasy is all about crude oppositions of good and bad, white and black. The main characters’ best intentions can lead to disaster, and often their intentions are selfish anyway. The descriptions of the world are lovingly detailed and rich, the writing is beautiful, and these are books I greatly admire. They are well worth reading – but not if you happen to be feeling low. Last, and most recent, Patrick Ness’s trilogy “Chaos Walking” is set on another planet. I haven’t really had time to discuss science fiction, and the border between sci-fi and fantasy is blurred at best. Is this a fantasy trilogy? Why not? There is no reason other than convention why a fantasy world has to be (a) medieval and (b) in some other dimension. The books ask: is there ever an excuse for violence? And there isn’t a clear answer: Todd, the adolescent main character, has a good heart and wants to do the right thing. But, the books ask, how do you know what the right thing is? Can you trust your own judgement? Are people what they seem? Can even first love – the most intense of experiences – sometimes be a selfish excuse for doing harm to others? Like Katherine Roberts’ Kherron, like Antonia Forest’s Patrick, Todd learns that you can’t always keep your hands clean. … I start walking all slow-like up to the biggest of the melty ice-cream scoops. I stay outta the way of anything that might be looking out the little bendy triangle doorway… and look inside. 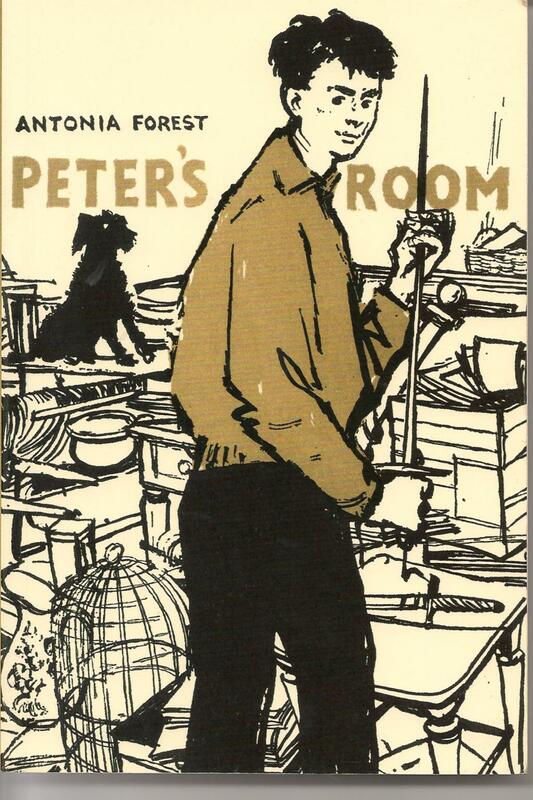 There are so many other books with fantasy worlds – Susan Cooper’s “Seaward”; Jan Mark’s “The Ennead” and “Riding Tycho”; Sally Prue’s “The Truthsayer” trilogy – but I have run out of space. These titles surely show that modern fantasy writers are still creating all sorts of other worlds for all sorts of different reasons. So next week I want to go into that a little further. Why do we do it? And what are the pitfalls? When shouldn’t you be writing fantasy? And I’m not talking about Elfland - which is a place no one invented, a place which in spite of its various glamours is always itself and always the same. I’m talking about complete, self-contained worlds like Middle Earth which seem – in their own terms – solidly real. Lewis believed such longing was a common human experience; for him it suggested the existence of God, and I think he believed at least one of the purposes of art was to create a yearning for something above and beyond this world. Whether he was right or not, I do know that he was enough of an artist to create a powerful yearning in many of his own readers. I longed for Narnia at least as much as I longed for a pony of my own; and both desires, at the age of ten, could compare in strength of feeling and emotional highs and lows, with being in love. 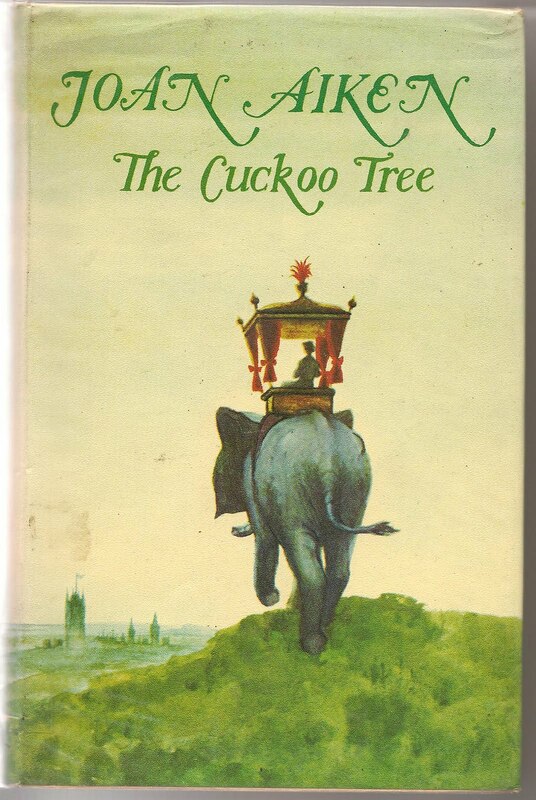 Having gobbled up the last of the Narnia books, I began writing my own. (It was the next best thing to getting there.) 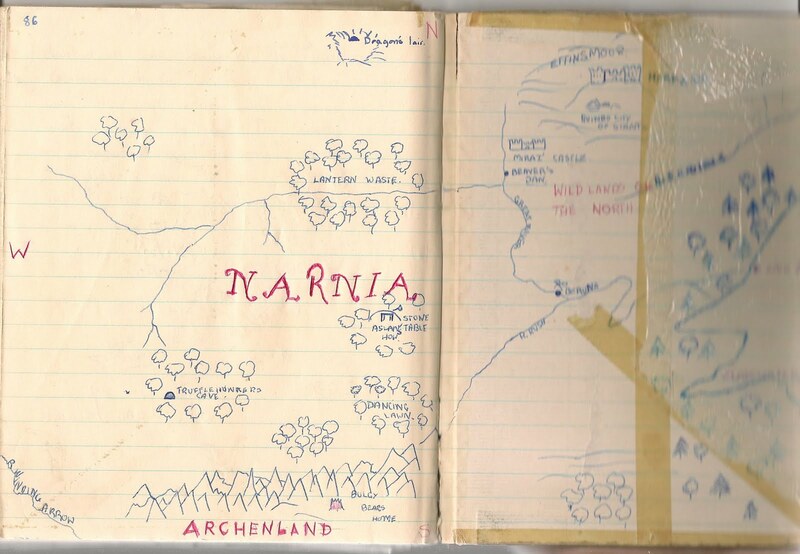 “Tales of Narnia”, I called it, and filled an old hardbacked exercise book with stories and pictures based on hints Lewis had left in the Seven Chronicles: “The Story of King Gale”, “Queen Camillo”, “The Seven Brothers of Shuddering Wood”, “The Lapsed Bear of Stormness”. (You can see more of it here.) 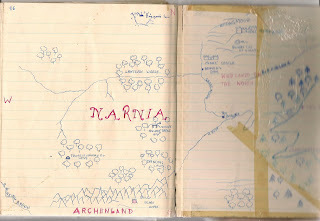 And I copied out Pauline Baynes’ map of Narnia in loving detail. 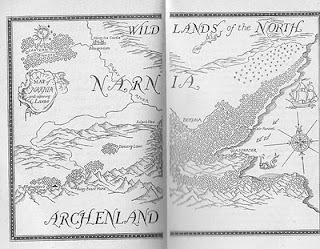 There it all was, as if looking down from an eagle’s eyrie: the indented east coast with Glasswater Creek and Cair Paravel; Archenland to the south; Dancing Lawn and Aslan’s Howe and Lantern Waste in the centre of the map; Harfang and Ettinsmoor to the north. Looked at in realistic terms, I suppose the map is really pretty sparse, but it didn’t matter. Narnia isn’t the sort of fantasy world in which one worries about economics, transport, coinage, or supply and demand. In fact, as soon as any of the characters start thinking in those terms themselves (Miraz, for example, or the governor of the Lone Islands) they get into trouble. (“We call it ‘going bad’ in Narnia,” as Caspian magnificently remarks.) Narnia self-corrects in that respect: it will allow the existence of a Witch Queen who rules over a century of winter, but it will not permit the existence of taxation and compulsory schooling. This can hardly be because Lewis disapproved of taxation and compulsory schooling. It’s because Narnia is a child’s world, and no ideal world for children is going to include anything so dull. People talk a lot nowadays about the Narnia stories as religious allegories. They really aren’t. There is Christian symbolism in the books, but that is not at all the same thing. And it went clean over my head as a child. Indeed, talking to some teenage Muslim girls lately, I got surprised looks when I mentioned the Christianity in the Narnia stories. They hadn’t noticed it either; I had to explain why, how Aslan is a parallel to Christ. I think Lewis, who only came to Christianity through stories, actually minded more about the story than the allegory. It’s perfectly possible for a child to read “The Lion, The Witch and The Wardrobe” under the impression that Aslan is no more and no less than the literal account makes him: a wonderful, golden-maned, heroic Animal. I know, because that’s the way I read it, and that is why I loved him – the Platonic Form of the Lion, if you like, though I couldn’t have put it in those terms. 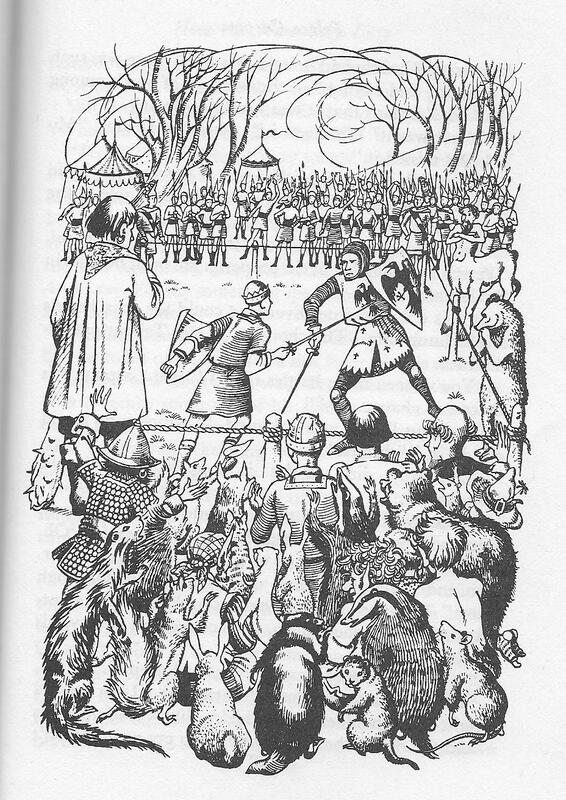 “The Last Battle”, in which the Christian parallels become more explicit, is far less popular with children, because everything goes wrong, and Narnia ceases to be, and Aslan turns into Someone Else: “And as He spoke, He no longer seemed to them like a lion...” What? What? I didn’t want the new heaven and the new earth and the new, improved Narnia, thank you very much. I wanted the old one, and Aslan the Lion, and things to go on as they always had. I might never have picked up “The Lord of the Rings” if it hadn’t been recommended to me by my maths teacher Miss Parker who found me drawing dragons in the back of my exercise book. I admired her (she was young, with short curly hair and a cheerful smile), so dutifully sought out “The Fellowship of the Ring” in the school library, and was swept away forever. Gone was the semi-detached air of facetious patronage I’d disliked in “The Hobbit”: here was a self-consistent written world that took itself entirely seriously. There was no way of getting there from here, no view from the outside. If Middle Earth is connected with ours at all, it’s far away in the depths of time. It’s a bigger, more grown-up place than Narnia, and an advantage of the quest theme is that we get to travel through it, solving one of the big problems with fantasy and sci-fi worlds: Worlds are huge places, and one spot cannot be representative of all. The length of the book ensures the sense of scale, too: travelling on foot, or at best by boat or on horseback, it takes the characters a realistically long time to get anywhere. The detail of the journey is part of the pleasure: fantasies in which deserts, ice-caps, jungles and seas flash by at bewildering speed give me motion sickness. This richness of visual, almost tactile detail is what makes the world of “The Lord of The Rings” so particularly actual and real. You feel you could dig a hole in the ground. And note how Tolkien uses description to make us feel uneasy: those “sunken roads long disused”, who made them? When, and for what purpose? Though we never find out, I’m willing to bet that Tolkien knew, and it is such small touches that build up the sense of Middle Earth as a place with a deep and often unsettling past. Is it odd that the things which make a fantasy seem most real are the things borrowed from our own world? Narnia often seems like a glorified Britain: those sunny woodlands with their ranks of blossoming cherries, those bright coves with their sea-splashed rocks, those dour rocky highlands patched with snow. 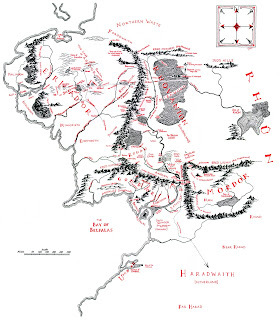 Middle Earth is a sort of ur-Europe, with its mountain ranges and plains and forests, all in the temperate zone. 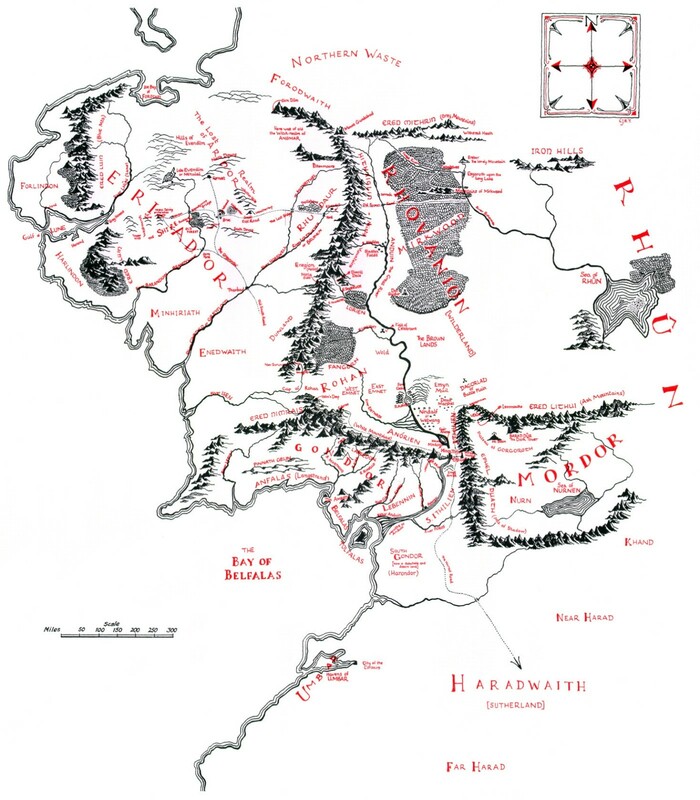 (For some thoughts about Mordor, see my post here.) We hear vaguely of hot southern lands in both fantasies, and neither Lewis nor Tolkien treats the south fairly. Calormen is an ‘Arabian Nights’ fantasyland, and Lewis avowedly hated the Arabian Nights. (It’s probably unwise to try writing about something you hate, and no amount of special pleading can quite let him off the hook. If you doubt this, imagine trying to explain to someone from Turkey or Iran, why this place whose entire idiom and setting is clearly based on an imaginary Baghdad, also includes the worship of Tash and a character like the Tisroc?) Tolkien’s dark-skinned southerners (“swarthy men in red” with “black plaits of hair” and “brown hands”) from Far Harad are in league with Sauron. In either case, the south is viewed as a place of delusion and error, of false opinions and false gods. Though I noticed this as a child, I did not recognise it as prejudice. Children accept things in books at face value. This is why it is important to think about what they are being offered. I certainly noticed – again without any sense of being taught a lesson – that the people in the next fantasy world I visited were all dark-skinned – except for the outlandish and savage Kargs. The island of Gont, a single mountain that lifts its peak a mile above the storm-racked North-east Sea, is a land famous for wizards. So begins Ursula K LeGuin’s “A Wizard of Earthsea”, the third in the triumvirate of imaginary worlds I discovered as a child. The Earthsea books aren’t a polemic. They are not satire: white readers are not supposed to see themselves in the Kargs, like the Yahoos in Gulliver’s Travels. LeGuin simply upends convention and supposes that for once, the ‘savages’ have white skin and blue eyes. Here is a strength of fantasy, the chance to see and do things differently: how often is it taken advantage of? I think writers often discover their own fantasy lands a bit at a time. LeGuin began the Earthsea books by asking questions about wizards: must they always be old, like Gandalf and Merlin, with long white beards? Why are they never young? Gradually these questions led to others. Why are wizards always male, anyway? What is it about wisdom, that we always picture it in this male form? Where do women come into it all? When, eventually, Ged relinquishes his wizard’s power, he grows in wisdom and humanity. 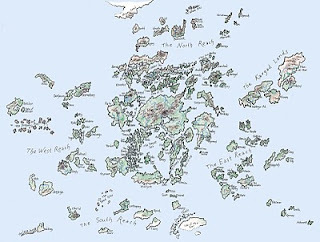 Once again there was a map, this time of islands like jigsaw pieces scattered across the sea. 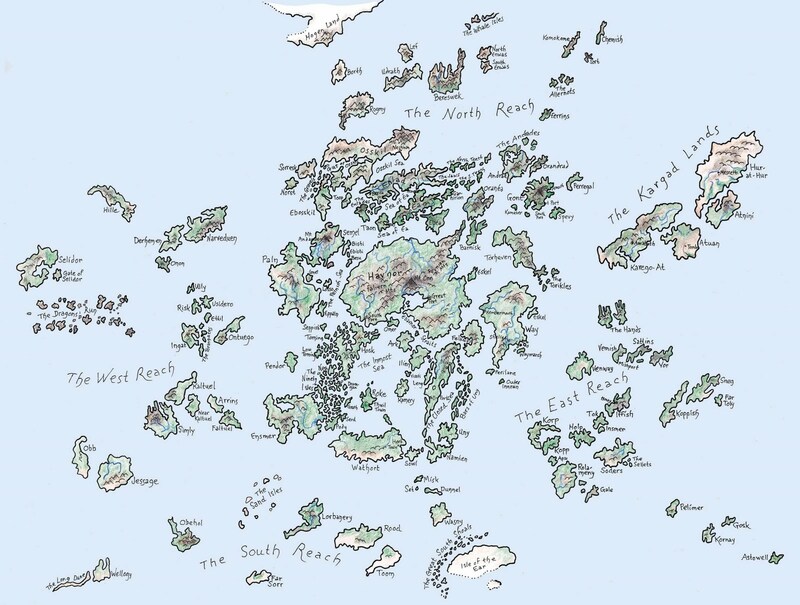 The Archipelago, with Havnor in the middle, the East Reach and the Kargad Lands; the West Reach, Pendor, and the Dragon’s Run. Perhaps even more than in Middle Earth, there was a sense of space: you could take a boat like Lookfar, and sail and sail until you sailed right out of the Archipelago into the Open Sea, and find the colonies of the Raftmen who never come to land; and beyond that, what? Summoning his power all at once and with no thought for himself, he sent his spirit out after the child’s spirit, to bring it back home. He called the child’s name, “Ioeth!” ...Then he saw the little boy running fast and far ahead of him down a dark slope, the side of some vast hill. There was no sound. The stars above the hill were no stars his eyes had ever seen. Yet he knew the constellations by name: the Sheaf, the Door, the One Who Turns, the Tree. They were those stars that do not set, that are not paled by the coming of any day. He had followed the dying child too far. Is it longing? Or is it more simply a pang of mingled delight and pain: sic transit gloria mundi? You can cram all things into a book. There’s a fairytale (which A.S. Byatt retold in “Possession”) about someone who goes underground and discovers a miniaturised enchanted castle under a glass dome. Fantasy worlds are a bit like that: little bottled universes that we can hold up to the light and use to examine huge questions about life and death and loss and the beauties and cruelties of the world. In about 1030 AD, the people of Roskilde Fjord in Denmark deliberately sank five old ships to block two of the three navigable channels leading into the fjord. 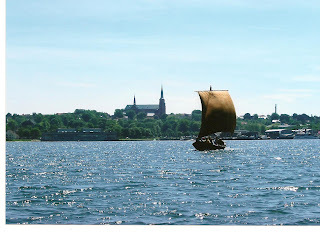 This meant the only remaining entrance could easily be controlled, and any ship wishing to come down the fjord to Roskilde town would be spotted, challenged, and perhaps charged a toll for use of the harbour and the chance to trade. Handy for the townsfolk then – and handy now: for those five scuttled ships have been rediscovered, raised and preserved, and are now a major tourist attraction as well as offering invaluable insights into Viking ship construction. As an amazing bonus, while digging the foundations for the new Viking Ships Museum they discovered not one, but nine more Viking ships buried in the silt. One of them is the very longest longship ever found – over 36 metres! Replicas of those first five ships, the ‘Skuldelev ships’, have now been built, and it was on some of these – five years ago this month – we were about to sail. 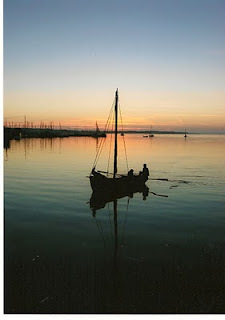 Arriving at Roskilde on a hot sunny June evening, we walked down through the town, past the great cathedral where no less than 28 of the Kings of Denmark lie buried, across the slanting cobbled square, and downhill under cool trees to the broad fjord. The sun was low, but it wouldn’t set properly till eleven o’clock or later. The western sky was full of colours, reflected in the fjord: stripes of tangerine, purple and blue. And there they were, outlined against the sky: the tall masts and upcurved prows and sterns of four Viking ships, tethered to the jetty. We walked past staring at them greedily: the two longships, Helge Ask and Sea Stallion of Glendalough; the fishing vessel, Kraka Fyr, the cargo ship, Roar Ege. And then we saw a square sail, black against the sunset. 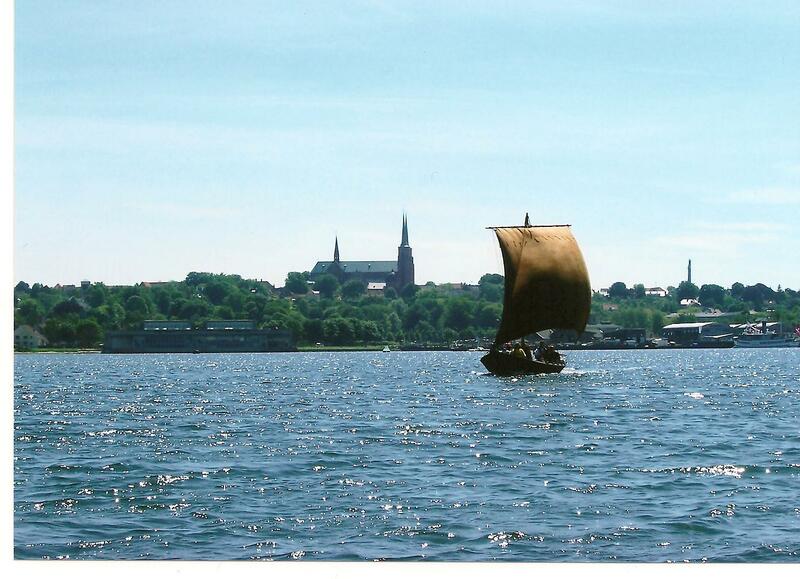 Another Viking vessel sailing towards Roskilde harbour, just as it would have done over a thousand years ago…and two swans swam across its path, like little Viking ships themselves, proud prows uplifted. I was there because I was in the middle of writing the third and final book of a series of historical fantasies about the Viking era, and in this book, ‘Troll Blood’, my characters would sail across the Atlantic to the shores of ‘Vinland’ – the far-distant northeast coast of America – just as Leif the Lucky, son of Eirik the Red, did over a thousand years ago. And, no matter how much research you do in libraries, no matter how many books you read, there’s nothing to beat hands-on personal experience. 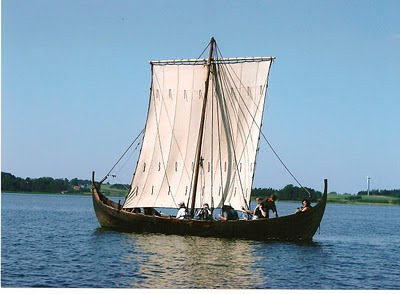 I’d found out that the Viking Ship Museum here at Roskilde ran a week-long sailing course in which I could learn a great deal about how to handle those great square-rigged sails, and all sorts of general things about how it really felt to be on the sea in a Viking age ship. The sail towers over the boat – how big it is! – seems to cut off the sky and a large part of the horizon. The chuckle and truckle of water running along the sides and under the bottom boards. Jellyfish pass by the end of my oar – ghostly circles in the dark water, frilled, pulsating. It’s really hard work on the sheets when we change the tack, wrestling in these yards of struggling, flapping sail – the ropes are harsh and soft at the same time, dark horsehair, softish but prickly to the hand. We yank and yank again, and the rope comes in through the hole in the gunwale, soaking wet, scattering spray like a dog shaking its coat. The boat heels, but nothing like so far as a modern yacht. To change tack, the opposite lower leading corner of the sail changes and is fastened close to the bow to the ‘tack stick’. Of course, most of the technical stuff never made it into the book; but I came away with confidence to write more truly, more realistically, about my characters’ voyage – even though they were headed out into the wild Atlantic, and I’d been sailing and rowing only in the fjord. Who says research is dull? We were there over midsummer. On St John’s Eve, we camped in a hayfield with the boats on the shore below, ate barbecued fresh salmon, and watched the bonfires being lit along the fjord, and later the fireworks competing with a full, yellow moon. One of the things I liked best about being on our ship was the feeling of camaraderie amongst the crew, and the way, when things got lazy and the wind was blowing, those of us not needed to handle sails could lie back, relax, and tell stories, jokes and tall tales. You realise how those Viking sailors must have done just the same thing. I say I’d love to hear, so he begins. ‘There was once a farmer’s wife, a lazy woman who would not weave the wool her husband provided. One day a huge, ugly woman came to the farm, and offered to card, spin and weave it for her – but on condition that the farmer’s wife should guess her name, and if she didn’t guess right, she would have to go away with the troll (for this is what the ugly woman was) and serve her. So the farmer’s wife agreed. She thought it wouldn’t be hard to guess the troll woman’s name. The troll woman sat down and carded and spun all the wool, and wove it into good cloth as fast as lightning. The farmer’s wife was very happy – but not so happy when she tried to guess the troll’s name. She tried this name and that, and they were all wrong. What a surprise! The Reclusive Muse of fantasy writer Katherine Roberts (her muse is in fact a rather splendid magical unicorn) has awarded this blog one of her very first Unicorn Glitter Awards, "for bloggers who post in the spirit of the enchanted mists." 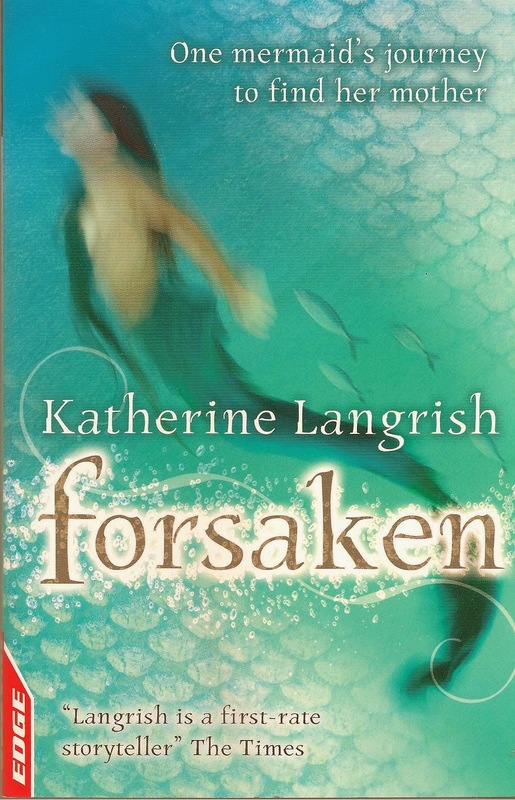 I've always been a big fan of Katherine's books (look out for the Echorium Sequence, beginning with Song Quest), so I'm especially pleased with this. You can see the award in the margin to the right of this post. Like other magical gifts, however, the rule is not to hang on to it in a selfish way, but to pass it on. Fantasy book: Almost impossible to say, there are so many. But I would find it hard to do without Tolkien and Ursula K Le Guin. Film: Hmmm - I don't watch that many! But one which made a big impression was Jean Cocteau's black and white classic of 'La Belle et la Bete'. Myth/Legend: Again, very difficult, but perhaps the Orpheus myth from the Greeks, and Yggdrasil the World Tree from the Norse mythology. Enchanted Creature: Has to be the Phoenix! Many thanks to Katherine and her Muse! Will you all excuse me today if I indulge in a little fanfare? Because this is the publication day in America of my book 'The Shadow Hunt' - and you can see the cover, to the right of this post. 'The Shadow Hunt' is what I would describe as a children's historical fantasy based on Celtic and medieval legends, and it took over most of my life for one and a half years. Writing a book is such darned hard work, and frankly such a lonely occupation, that a publication day is genuinely a time to rejoice. As I've explained, I gave this blog its name because writing is very much like crossing seven miles of hill on fire and seven miles of steel thistles, and seven miles of sea. When you begin writing a new book - as I'm doing now - it feels impossible. IM-possible. I have these ideas, and these characters, and a situation, and I feel I don't know half enough about them, and I set out on a long journey of discovery, all the time with the fear that I'll never get there. But gradually, at a snail-like pace, the pages stack up till there are twenty... fifty... a hundred... (I print out and revise as I go: it may well take me months to write a hundred pages) ...till I find myself in the middle of the book, in the middle of this long stretch of work that's been going on seemingly forever, and will go on seemingly forever. And at this point, I sleep, eat, dream the book. I go to bed at night with my mind running the characters like a computer simulation, and I wake in the small hours and in the mornings thinking about them and understanding a little bit more and a little bit more. It's exhausting, exhilarating, terrifying, and highly anti-social. My life is subsumed into the writing process. I read, but only books which will help with the research, the background, the symbolism, or the actions of the characters. I go for walks or drives, so that I can think and think about the book. I shut myself up to go over and over the pages already written, to rewrite, to shred, to revise, to - as far as lies within me - to perfect. The tipping point comes. A day arrives when I recognise that the book WILL BE WRITTEN: that enough has been done to give the story a life of its own. Like an unborn child, it's viable. Life gets a little easier then. And at last the final chapter, the final pages get written in a rush of euphoria. It's done! I've finished! Free at last of the awful tyranny of the powerful god or daemon of creation. Free for a while to do ordinary things, think ordinary thoughts, dig the garden, go shopping. The editing and all that - that's just work, to be enjoyed or grumbled through in an everyday way. It's not to be compared with the sucking-you-down-into-the-deeps, never-letting-you-get-a-breath, octopus-grip of the creation-god. So here's to publication day, along with a couple of starred reviews from Kirkus and Booklist, and the very pleasant news that 'The Shadow Hunt' has been chosen by the Junior Library Guild, to be reviewed in its July edition. You can find out more about it on my website. If you think the book sounds like something you might like, please give it a go!